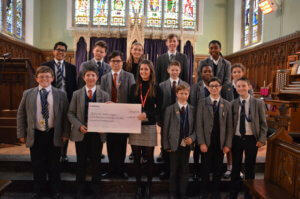 Charity is key to our mission at St Edmund’s College and Prep and this year we were delighted to present a cheque to Noah’s Ark Children’s Hospice for an outstanding £16,682.25. Raised by student and staff efforts during Charity Week through activities, cake sales and so much more this money will be used to fund a Noah’s Ark Children’s Group for seriously unwell children for a whole year. We have supported Noah’s Ark for a number of years and this donation brings the overall amount donated to £56,058 which is enough to keep the charity afloat for one week. Noah’s Ark Children’s Hospice is a community-based hospice service providing support for babies, children and young people with life-limiting or life-threatening conditions and their families in North and Central London and Hertsmere.